The EcoHitch® Stealth hitch for the 2012-2019 Tesla Model S is designed to be completely concealed with a removable receiver so you don’t have to see an unsightly crosstube underneath your vehicle. Rated for 300 pounds tongue weight and 2,000 pounds towing weight, the Stealth hitch for the Model S touts strength that supports your adventurous side. If you’re going to be towing and need trailer wiring, click here! Ensure your wiring harness does not drag on the ground by visiting our Eclipse trailer wiring bracket. This trailer hitch for Tesla Model S allows you to bring your extra cargo, bikes and whatever else you need to bring without affecting the look of your vehicle. The safest, most exhilarating sedan on the road, your Model S needs a trailer hitch that will be able to keep up with all of your driving needs, especially one that is as low profile as the EcoHitch Stealth hitch. With the EcoHitch for Tesla, we have manufactured a perfect complement to your sleek Model S. The EcoHitch Stealth hitch for the Tesla Model S comes in both 1¼-inch and 2-inch receiver sizes so you get your choice of which bike racks and cargo trays will work best for the receiver you choose. The Tesla Model S EcoHitch® Stealth hitch is designed to be removable when not in use, so no one will know you have a trailer hitch installed unless you are using it to haul your bikes or extra cargo. 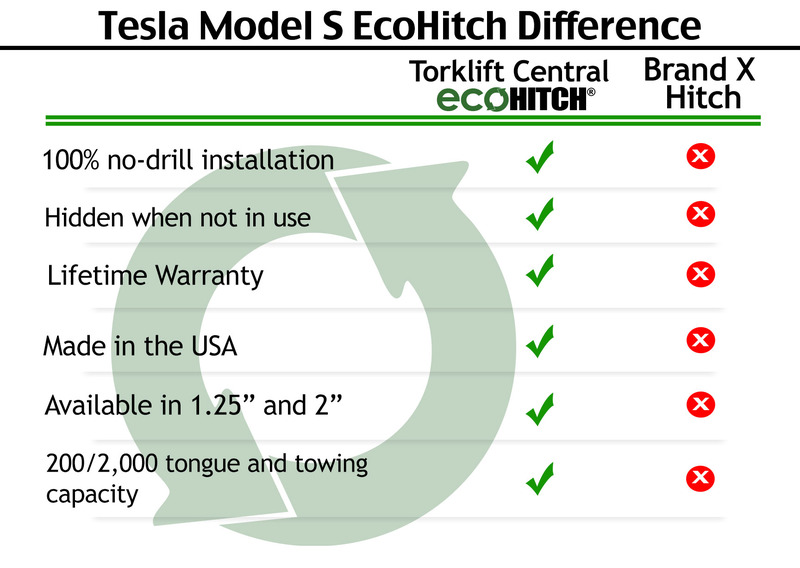 As an added bonus, there is no drilling to install the EcoHitch, so you don’t have to drill into the frame of your Model S.
This trailer hitch for Tesla will let you maintain a great drive in your Model S without changing style or efficiency since you can remove the receiver when it’s not in use. With 300 pounds tongue weight and 2,000 pounds towing weight capacity you won’t have to leave anything behind with this hitch for Tesla Model S, and it’s also been tested to fit the refreshed version of the 2016 Model S.
x7201 36.3 lbs 53" x 12.5" x 14"
x7202 33.6 lbs 53" x 12.5" x 14"